YouTube on Thursday launched a pilot program of paid channels for its online video service, calling it part of an effort "that enables content creators to earn revenue for their creativity." The Google-owned video-sharing service said the launch with "a small group of partners" starts Thursday with subscription fees starting at 99 cents per month. "Every channel has a 14-day free trial, and many offer discounted yearly rates," a YouTube blog post said. "This is just the beginning. We'll be rolling paid channels out more broadly in the coming weeks as a self-service feature for qualifying partners. And as new channels appear, we'll be making sure you can discover them, just as we've been helping you find and subscribe to all the channels you love across YouTube." Google bought YouTube in 2006 for $1.65 billion. The service is believed to generate a small amount of revenue from advertising, but the content has been free. 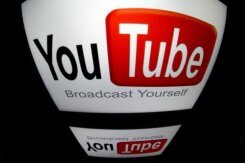 YouTube on Thursday launched a pilot program of paid channels for its online video service, calling it part of an effort "that enables content creators to earn revenue for their creativity. The new paid channels include Acorn TV, which offers British TV programs at $4.99 per month; National Geographic Kids, at $2.99 a month or $30 a year; and PrimeZone Sports, at $2.99 per month. "If YouTube were a country, we'd be the third largest in the world after China and India," the team said in March.